DRMetrix, the industry’s leading television research company, has released its 2017 industry study providing insight into the size of the brand-direct and direct response television industry. DRMetrix is the brainchild of Joseph Gray, a 30-year television advertising veteran who has long thought that the size of the brand-direct and direct response television industry has been under-estimated by mainstream television research companies. The ability to measure the size of the industry alluded him as research companies were unwilling to segment ‘direct response' commercials from traditional branded commercials. Nearly a decade later, Gray mustered the resources and started DRMetrix to tackle the problem. Prior to the beginning of the 2015 broadcast year, the company deployed its AdSphere™ monitoring platform which today monitors over 120 national cable networks 24/7/365. AdSphere™ was designed using the latest “automated content recognition” (ACR) technology along with advanced pattern and optical character recognition technologies to sniff out any television ad or program that includes direct response attributes such as 800 numbers, web addresses, SMS, etc. AdSphere projections for the 2017 broadcast year are the result of monitoring 120+ national cable networks. To date, AdSphere has identified over 7,700 brand-direct and direct response brands which have included some combination of 800, Web, Mobile App Response and/or SMS allowing consumers to directly respond. In addition to detecting over 272,000 infomercial (28.5 minute) airings, AdSphere has detected an astonishing 25.7 million spots with an average run time of 39.32 seconds up to a maximum of 5 minutes in duration. 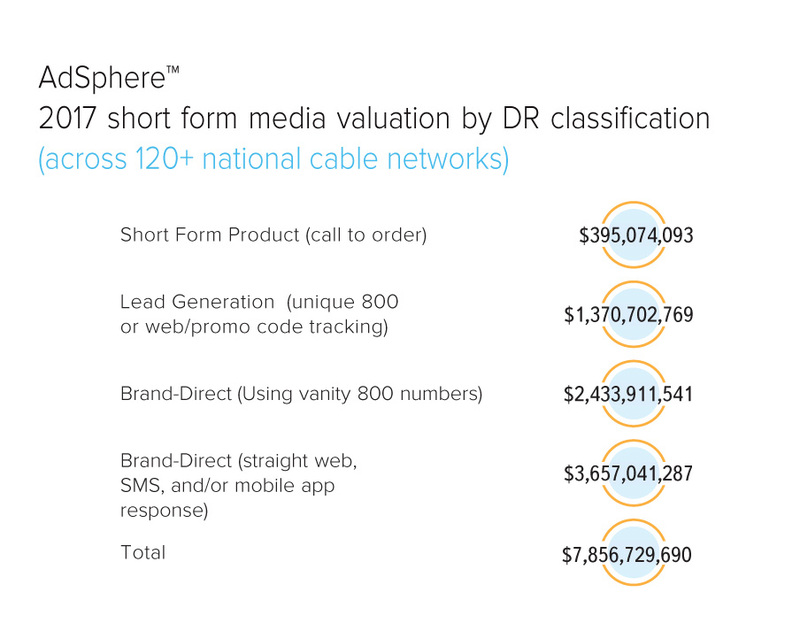 For 2017, AdSphere has calculated the valuation of industry inventory at $7.8 billion dollars applying average direct response rates and weighting the value of spots running across two different types of national cable ad breaks.